RUSH: Now we’ve learned, ladies and gentlemen, because of the great journalists at ABC News… Did you know that Andrew McCabe was conducting a secret investigation of Jeff Sessions? Did you know that? He was investigating Jeff Sessions for lying during his confirmation hearings about his contacts with the Russians, and do you know why that investigation began? Because McCabe got a letter of complaint from Senator Pat “Leaky” Leahy and Al Franken demanding that Sessions be investigated. Sessions did not know it was happening at the time. Very few people knew! Sessions has since been cleared by no less than Mueller! But the reason this is all important is now because they’re saying, “When Sessions found out that he was being investigated, why, that explains why he fired McCabe. This is revenge! 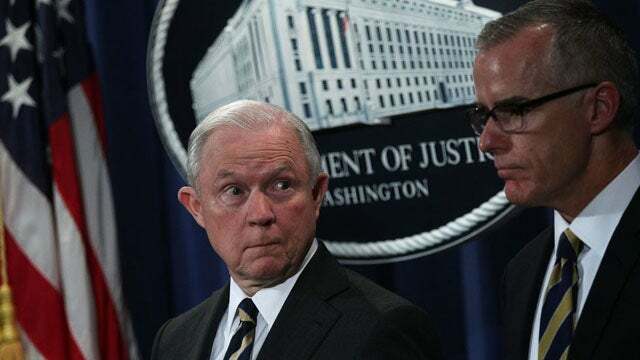 This is Sessions getting revenge to McCabe for investigating him,” and that is BS caca, because Sessions did not fire McCabe. He delivered the news. The FBI inspector general and a couple of ethics people within the FBI determined that McCabe should be fired. But, see, this is how this all works. They now tell us that Sessions was under investigation for lying, and when Sessions found out about it, he got mad, and he turned around and he said, “Oh, yeah, McCabe? Investigate me? Well, you’re gone,” and that’s become a narrative in the Drive-By Media today. But I’m telling you this: There is much more to that, this investigation of Sessions, and the fact that it was leaked to ABC.